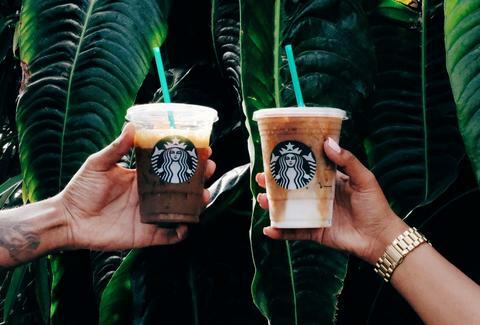 Good news for those of us who prioritize caffeine over whimsy when it comes to iced Starbucks beverages: the coffee mega-chain just announced that it's offering a buy one, get one free deal on all of its iced espresso drinks this week through July 2. Starting today, June 27, through Sunday, July 2, stop by almost any Starbucks location between the hours of 2pm and 5pm, order any grande iced espresso drink, and you'll score a second iced espresso drink of the same or lesser value on the house. The BOGO deal applies to any iced menu item that contains espresso. Unfortunately for the Frappuccino addicts among us, it doesn't extend to blended beverages. Still, that leaves a hell of a lot of options for you to pick from, including some of the chain's most popular (and best) drinks, from an Iced Caramel Macchiato to an Iced Caffé Macchiato. The chain is also encouraging people to try some variations on the classics, though that may cost you a little more. Of course, you'll still have to pay for one of the drinks to get the deal, but if you go in on it with a friend every day this week and you'll each be saving a good chunk of change. And probably be well-caffeinated.